Justine Horne joined the Human Environments Analysis Laboratory in September 2016. She is co-supervised by Professor Jason Gilliland of the Human Environments Analysis Laboratory and Associate Professor Dr. Janet Madill, PhD, RD who is a faculty member at Brescia University College. 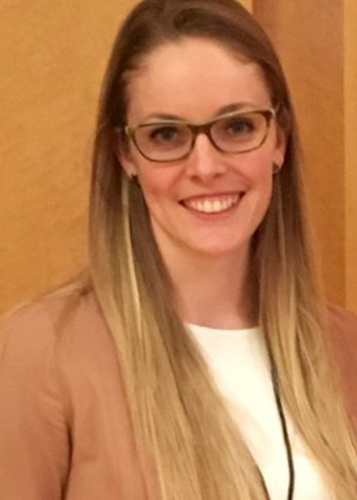 Justine’s research is focused on behaviour change and body composition changes with the provision of DNA-based dietary advice in two distinct populations at high risk for overweight/obesity – prediabetes patients and transplant recipients. She is interested in finding novel, innovative strategies to enhance patients motivation to improve dietary and physical activity habits. As a registered dietitian, Justine’s research is directly related to her clinical practice. Horne J, Madill J, O’Connor C, Shelley J, Gilliland J. (2018). The impact of genetic testing on behaviour change: Are we using high-quality interventions and considering behaviour change theory? Lifestyle Genomics. Rinaldi S, Kurowski C, Horne J, Hannaberg P, Brown C, Mura M, Mehta S, Madill J. Vitamin D intake and status in three patient populations: Interstitial lung disease, pulmonary hypertension and patients participating in the Group Lifestyle Balance weight management program. ASPEN: Clinical Nutrition Week, Las Vegas, United States [Abstract Publication]. Horne J, Madill J, Gilliland J. (2017). Incorporating the Theory of Planned Behaviour into personalized healthcare behaviour change research: A call to action. Personalized Medicine.